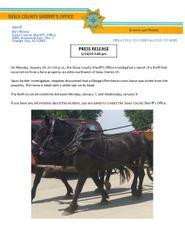 Information sought in horse theft investigation near Sioux Center, IA. We are seeking information about a horse theft investigation. See our press release attached to this message for further information. Please contact the Sioux County Sheriff's Office if you have any information about this crime.